I was browsing through Tiffany & Co. the other day (dreaming really!) when I overheard the sales clerk giving a wonderful home remedy tip! Of course my ear’s perked up and I waited patiently to ask her for permission to post this idea. As soon as I got home, I mixed this potion up, plunked my ring in, and a little while later I had a diamond ring that glistened and glittered like it was brand new. You must try this. 1. Mix together the water and ammonia. 2. Put the mixture into a small container (I used an empty prescription medicine bottle, which worked perfectly). 3. Put the ring into the container. 5. 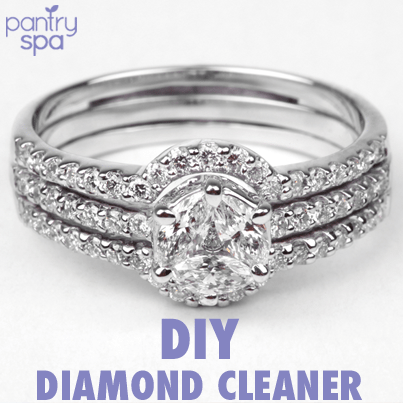 Remove the ring and brush with a soft brush (like a soft old toothbrush that has been sterilized in the dishwasher).